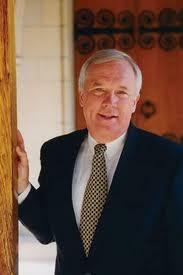 Photo of Will Willimon, professor of the practice of Christian ministry at Duke University. Will Willimon has served at Duke University in a variety of roles for decades, but he always left to continue his calling as a Methodist minister. He knew from an early age that he had a special connection to God. "I think I always had an extraordinary sense of the divine," he said. Though, he said that his fundamentalist upbringing in rural South Carolina scared him off from faith for a while. "I sort of decided that Christianity was for people who weren't very good at thinking things through," he said. When he went off to Wofford College, he was exposed to a religous studies professor who helped him see a different view of Christianity. "I remember thinking in my little undergraduate imagination...wow, this professor, you could say a lot about him, but he's not stupid. And he's a Christian," he said. He realized at Wofford that he wanted to continue on the religious path. Something he would do at Yale Divinity School, and later, Emory University. But when he first had the idea, his mom wasn't so sure it was a good idea. "She said, 'Well, I don't think it will work out that well,'" Willimon said. He added that she thought to be a minister you needed to be able to flatter others, something she didn't think he'd excel at. But he found his niche, traveling back to South Carolina to be a minister at a Presbyterian Church there. He went from there to preach at North Myrtle Beach, where a member of Duke's Divinity School invited him to come teach there. He stayed for a while but missed being a minister. He left to work at an inner city church in South Carolina, but he was once again invited to Duke, where he returned to serve as Dean of Duke Chapel for the next 20 years. He would leave once again to become a bishop, but he has returned for a third stint. He is currently a professor of the practice of Christian ministry at Duke Divinity School. He has also written his first novel, "Incorporation," a satire on a Christian church in the midwest.